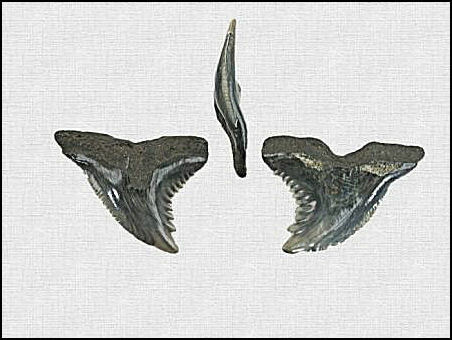 The upper and lower teeth of the snaggeltooth shark (Hemipristis serra) differ so much that in some early reference material they were listed as difference species. It is the upper anterior and lateral teeth, with their large serrations, designed for cutting that are so popular with collectors. The lower teeth have more of a clutching design. The serrations on the upper teeth reach almost to the point of the crown. On the lower anterior teeth, the serrations may be missing or appear as small irregular cusplets. These serrations become more regular and uniformed in the lower laterals, but unlike the uppers only reach about halfway down the crown. 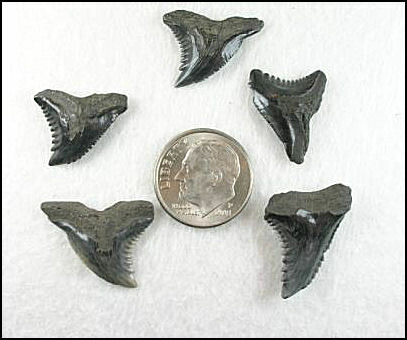 These teeth average about 1 inch, with a maximum size of about 1 1/2 inches. A nice NJ "Hemi" upper lateral. Lingual, labial and profile view of an upper lateral. Upper anterior tooth with the distinctive coarse serrations. a wide degree of variation. In many cases they are completely absent. Collected by Cris C. from Florida. of a partial cutting edge. 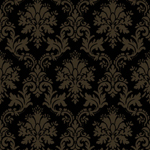 See the cutting edge comparison page.